In a large bowl, mix together cornmeal, baking powder, sugar and chipotle chili powder (1/2 tsp gives it a slight kick; 1 tsp is good for spicy food lovers). In a separate medium bowl, beat together egg, milk and vegetable oil. Pour into large bowl and stir to combine. Pour batter into a greased 8-inch round souffle dish (or a 9 x 5-inch loaf pan) and bake 20-30 minutes until a toothpick inserted into the center comes out clean. Cool for 10 minutes in dish and then cool completely on a wire rack. I have a confession: I don't like spicy food. Especially in the summer when the temperature gauge is often up into the 90s (or at least it is out here in Iowa -- will it ever cool off? ), the last thing I want to do is bite into something that makes me feel even hotter. And heavy, spicy foods in summer? Forget it. That said, I was pleasantly surprised to find that this Chipotle Corn Bread, though seemingly spicy and heavy, was really neither. 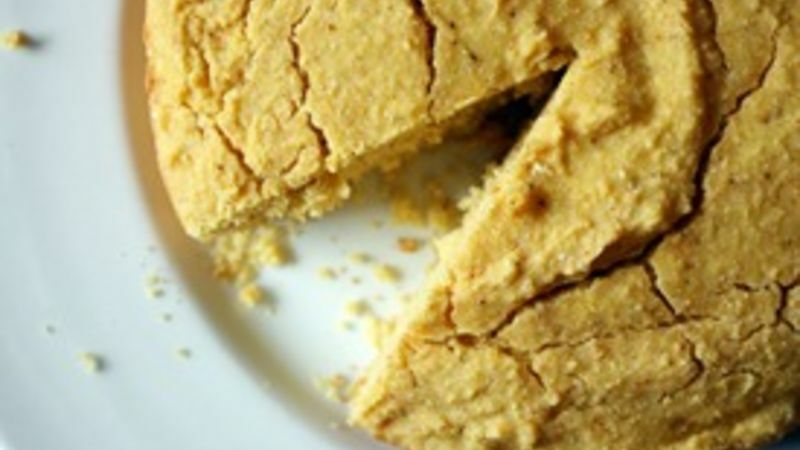 Sure, it's got a lovely kick to it that sneaks up on you a few seconds after your first bite, but it's probably one of the lightest (in both weight and calories) corn breads you'll ever make without sacrificing that famously dense texture. I'm a huge fan of corn bread. There really isn't a version of it I don't enjoy. With or without corn kernels, buttery or dry, muffin-shaped or in a rounded loaf (like this one), it's always been a staple next to my barbecue and Southwestern/Tex-Mex dishes. I found this Chipotle Corn Bread to be particularly tasty with a light black bean soup for a quick lunch or dinner. This loaf, like corn bread itself, is also incredibly versatile. Add more chipotle powder to the batter for an even spicier flavor, or chop up onions and red and green peppers for a more substantial bread. If you don't have a soufflé dish in your kitchen, pour the batter in a 9 x 5-inch loaf pan or double the batter and make corn bread muffins. However you bake it, you too may find it adds a little spice to your summer meal. Stephanie (aka Girl versus Dough) has joined Tablespoon to share her adventures in the kitchen. Check outStephanie's Tablespoon member profile and keep checking back for her own personal recipes on Tablespoon!